March to the beat of your own fund raising drum! When you signed up to play the tuba in your school orchestra, you might not have expected that being "with the band" meant that you would be expected to chip in your ideas and time to run organized fundraising events. Toy drives, bake sales, carwashes and various charity ventures are the reason why many school band programs can afford to exist. 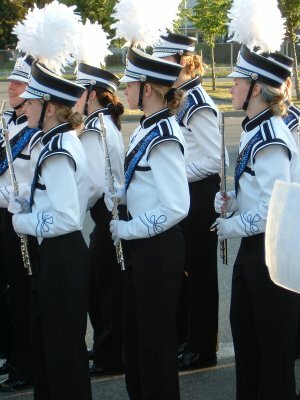 Funds raised via charity events also go towards fixing and maintaining musical instruments, towards purchasing new sheet music, towards funding, or subsidizing, band travel expenses to other schools, band competitions and parades, and to hopefully help cover some uniform costs and to update musical instruments. As a parent, you know that your child's love of the saxophone can be an expensive passion. And less and less school boards are covering the costs, or even subsidizing for band uniforms, sheet music, trips to concerts and competitions. We don't have to tell you that being "with the band" really adds up. That's where organizing a school band fundraiser can help out! A successful fundraiser can be critical to the existence of your child's school band program. Organizing a fund raiser takes a lot of work. That means you are willing to put in the time, but if you do you're expecting it to be a success. School bands can have hundreds of members, so you want the biggest bang for your so called snare drum. You also want your school band fundraiser to stand out from the rest, because chances are the science club, cheerleading squad, chess club and debate team are all vying for donations from local businesses and neighbors as well. That's why it's important to come up with a unique idea for raising charity funds that everyone will want to come out to. Discount Cards - These cards typically feature your band or high school logo on the front, and a dozen or more local business sponsors on the back that offer discounts that they buyer of the card can redeem within a one year period. For example you might pick a variety of local services – hair salons, restaurants, coffee shops, delis, hardware stores, grocers, car washes and so on – who will agree to offer discounts to support your fundraising cause. The benefit of selling discount cards as fundraising items is that it's a win-win situation for the buyer and the sponsors. The buyer typically reaps double the sale price of the card in savings – and the sponsors attract a slew of new customers. Online discount card services will typically supply the cards with your school logo. All you have to do is supply a list of local businesses you'd like to feature as sponsors, and the card service will contact them. It usually costs nothing up front to have the cards made. Gas Station Helper - Contact a local gas station and ask if they will allow your school band to pump gas for customers. You can either ask the gas station to make a lump donation or you can ask for each car to make a donation to your fundraiser. While you are pumping the gas, you may also want to have a few school band members play music and wash the windshields. As many people are moving towards self-service gas stations this will be a great idea. It's a win-win-win situation for your school band fundraiser, the gas station and its customers. The best thing about this is that there is no seed money needed. You just have to make sure that you have enough of your school band to show up for the fund raiser and enjoy the fundraising. Calling Flamingo Animal Control - Have the band purchase 15 pink plastic flamingo lawn decorations. Then have your band decorate each flamingo with the bands colors. When they are done decorating the flamingos, place them throughout the neighborhood lawns. Attach a note that introduces your band and explains that for $10 the band will return and remove the flamingo. Better yet, for a $20 donation they move it to the lawn of their choice. Make sure that when you decorate the flamingo with the band colors you also make a sign explaining the band fundraiser so that people driving by can contact you and help even more with your fundraising. You'd be surprised at how many local neighbors will jump on your fundraising "band" wagon to support your cause – and play a prank on their unsuspecting neighbors in the process. Sentence the Principal – Organize a principal kidnapping. The kidnappings can also extend to well known teachers, athletes, cheerleaders or even Larry the custodian. Erect a fake jail cell and situate it in a central spot where everyone will pass it. Then put a fairly hefty ransom price on them and take ransom donations from passers by. Once the full ransom is collected let the principal go and send the school band members out to kidnap their next jail bird. You can make this fund raiser interesting by not only raising money for ransom, but also for sentencing. For example, donate $5 to set Principal Jones free, or donate $5 to add 5 more minutes to his sentence. This charity event will cost little overhead to put together. You just need materials to make the jail and volunteer band members and jail birds. Music Marathon - Your band can fund raise by hosting a music marathon. The school band members can ask people to pledge funds for every song the band will perform. The school band should set up in a public place and plays all of the songs on the list of requests from those that donated. While the band performs, other school band members or parents, can walk around and explain the fundraising event you are hosting and ask for donations. You can also ask companies if they want to sponsor the event. Make sure to let the local newspaper, TV and radio station know about the event ahead of time, so that they can cover it on your local television station or paper – the more exposure you get leading up to the event; the more people you can expect to come out and support your cause.